Can the UN's 90-90-90 Strategy to End HIV Really Work? Can the UN Strategy to End HIV Epidemic Work? To identify 90 percent of people living with HIV through expanded testing. To place 90 percent of positively identified individuals on antiretroviral therapy. To ensure that 90 percent of those on therapy are able to achieve undetectable viral loads indicative of treatment success. It is known that by achieving this level of viral suppression, people with HIV are far less likely to pass the virus to others. By doing so on a global scale, UNAIDS officials strongly believe that the epidemic can effectively be ended by as early as 2030. But is it really as easy as all that? Even the most ardent supporters of the strategy acknowledge that such targets have never before been achieved in the history of public health. In the same breath, however, most will also agree that without the aggressive expansion of existing national HIV programs, the window of opportunity to stave that global crisis could be all but lost. It was this latter reality that eventually led to the endorsement of the 90-90-90 strategy at a United Nations High-Level Meeting on Ending AIDS, held in New York City in June 2016. According to a 2016 UNAIDS report, while there have been impressive gains made in the years leading up to the 2016 endorsement, the progress has been by no means uniform. On the plus side, an estimated 17 million people are reported to have been receiving HIV treatment in 2015, almost double the number treated in 2011. In total, almost 57 percent of those living with HIV know their status, a trend that puts us well on our way to achieving the 90 percent testing target by 2020. On the minus side, less than half of those diagnosed with HIV (46 percent) are currently receiving treatment, while only 38 percent are able to achieve undetectable viral loads (due primarily to treatment gaps and inconsistent care). With underfunding and a lack of donor commitment set to impede the expansion of global programs, the ability to improve upon these figures could likely be dramatically undercut. Even in the U.S., national figures are falling well below the benchmarks set by the UN, with the Centers for Disease Control and Prevention reporting that, of the 1.2 million Americans living with HIV, 86 percent have been diagnosed, 36 percent are on treatment, and only 30 percent are virally suppressed. As a whole, Central Europe, Western Europe, and North America are faring best, with 86 percent of the HIV population positively identified, 56 percent on treatment, and 47 percent achieving an undetectable viral load. In sub-Saharan Africa, a region which accounts for 67 percent of all global infections, progress has been impressive in many of the hardest hit countries, with Botswana, Rwanda, Malawi, Swaziland, Kenya, and Lesotho well on their way to achieving the fast-track targets. Similarly, Asia, Thailand, and Cambodia are well ahead of their 2020 targets, while China has already reported an impressive 91 percent rate of viral suppression among its treated population. In terms of treatment delivery, Latin America and the Caribbean are reported to have the highest coverage overall (55 percent), with Brazil reporting more than 80 percent of its HIV population has been identified and more than 85 percent are virally suppressed. By contrast, in other parts of Latin American—as well as Eastern Europe, Western Africa, Eastern Africa, and Central Africa—higher rates of HIV testing have not resulted in either higher rates of treatment or viral suppression. Access to care and supply chain failures continue to hamper progress within these regions. Faring even worse are Eastern Europe, Russia, and Central Asia, where injecting drug use continues to drive infection rates. Barrier to care within these regions (including homophobia and criminalization) have led to dramatic increases in the annual infection rate. According to UNAIDS officials, in order to reach the 90-90-90 targets, international funding will have to increase to an estimated $19.3 billion by 2017. After this projected peak, annual costs will decline to around $18 billion by 2020, due largely to projected reversals in infection rates. Should the program goals be reached, the benefits could be enormous, as evidenced by a 2016 study from the Harvard University Center for AIDS Research. 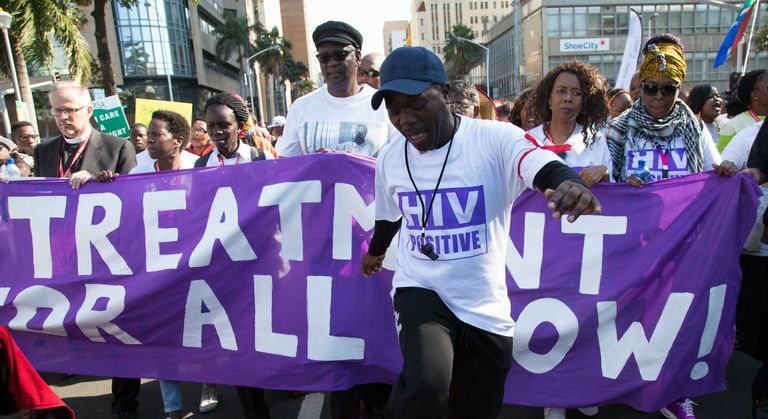 According to the study, the implementation of the strategy in South Africa—the country with the world’s largest HIV burden—could avert as many as 73,000 infections and 1.2 million deaths over five years, and 2 million infections and 2.5 million deaths over 10 years. While the cost of implementation was pegged at a staggering $15.9 billion in South Africa alone, the cost-effectiveness of the plan (in terms of fewer hospitalizations, deaths, and maternal orphans) was deemed to justify the high expense. While the funding goals like these may seem reasonable, given the long-term benefits to national health systems, the simple truth is that global contributions have continued to decline year on year. From 2014 to 2015 alone, international donations fell by more than a billion dollars, from $8.62 billion to $7.53 billon. Even the U.S, who remains the single largest contributor to the global HIV initiative, contributions under the Obama administration have flat-lined since 2011. Most pundits suggest that the trend will continue, with many in Congress calling for the "re-purposing" of funds rather than an increase in overall AIDS spending. Sadly, in order to reach the 90-90-90 targets, the U.S. contribution would need to increase by at least $2 billion within the course of the current funding cycle. As it currently stands, the U.S. has agreed to match one dollar for every two contributed by other countries, but only up to a hard ceiling of $4.3 billion (or one-third of the Global Fund’s $13 billion goal). This actually translates to a reduction in the ceiling from the previous $5 billion, with only marginal 7 percent increase from the previous $4 billion U.S. contribution. By contrast, many countries with far deeper economic woes have stepped up their commitments, with the European Commission, Canada, and Italy each upping their pledge by 20 percent, while Germany has increased theirs by 33 percent. Even Kenya, whose per capita GDP is 1/50th that of the U.S., has committed $5 million to HIV programs outside of its national borders. But even beyond the issue of dollars and cents, the impact of the 90-90-90 strategy will put added strain on many national health systems that have neither the means to absorb the funding nor the infrastructure or supply chain mechanisms to effectively deliver care. Medication stock-outs are already regular occurrences in many parts of Africa, while the failure to retain patients in care is reversing any gains made by placing individuals on therapy in the first place. Without the additional funds to address these and other structural barriers, UNAIDS officials warn the cost of failure could be high—resulting in an estimated 17.6 million new infections by 2020 and 10.8 million deaths. Can We Treat Our Way Out of the Epidemic? While remarkable progress has been in curbing the global HIV epidemic, investigators at the London School of Hygiene and Tropical Medicine suggest that the 90-90-90 targets have little chance of ending the crisis by 2030. The strategy, they assert, is based on evidence that expanded treatment can reverse infection rates by lowering the so-called "community viral load"—a strategy known popularly as Treatment as Prevention (or TasP). The introduction of highly potent combination therapies, known at the time as HAART (or highly active antiretroviral therapy). The advent of generic antiretrovirals, which made the drugs affordable for the developing countries. The introduction of more effective HIV drugs, such as tenofovir, as well as simpler, single-pill combination therapies. However, since that time, there have been only modest decreases in the global infection rate. In fact, of the 195 countries included in the study, 102 experienced annual increases from 2005 to 2015. Among those, South Africa reported increases of over 100,000 new infections from 2014 to 2015, adding to the 1.8 million infections in Africa and the 2.6 million reported globally each year. Meanwhile, HIV prevalence (i.e., the proportion of a population living the disease) has increased by an average of 0.8 percent year over year since 2000, to an estimated 38.8 million by 2015. And while mortality rates have decreased from 1.8 million deaths in 2005 to 1.2 by 2015, HIV-associated illnesses have increased dramatically in many countries. Tuberculosis (TB) is a case in point, accounting for nearly 20 percent of deaths among people living with HIV (predominantly in developing countries). Yet despite the fact that HIV co-infection rates run high in people with TB, HIV is frequently omitted as the cause of death (or even the contributing cause of death) in national statistics. The researchers further noted that rising infection rates paired with longer life spans (a result of expanded treatment coverage) will require governments to manage an ever-increasing population of HIV-infected individuals. And without the means to sustain viral suppression within that population—and not just for a few years, but for a lifetime—it is all but likely that infections rates will rebound, possibly dramatically. While there is compelling evidence that TasP can reverse HIV rates in high-prevalence populations, researchers argue that we cannot rely on treatment alone to end the epidemic. They instead advise dramatic changes in the way that programs are both financed and delivered. These include an increase in domestic funding, allowing for the free flow of even cheaper HIV generic drugs, and investing in the improvement of national health delivery systems. It would also demand more effective preventive interventions, including an investment in harm reduction strategy for injecting drugs users, the strategic use of HIV pre-exposure prophylaxis (PrEP) in appropriate populations, and a reinforcement of condom programs at a time when usage among the young is on the wane. Without these foundational changes, the researchers argue, the 90-90-90 strategy will likely have more impact on mortality rates and less on achieving a durable reversal of HIV infections. Carter, M. “​Ending AIDS by 2030 a distant prospect: global HIV incidence, treatment coverage and mortality figures suggest.” NAM AIDSMap. August 2016. GBD 2015 HIV Collaborators. “Estimates of global, regional, and national incidence, prevalence, and mortality of HIV, 1980-2015: the Global Burden of Disease Study 2015.” The Lancet. August 2016; 3(8):e361-e387. Jamieson, D. and Kellerman, S. “The 90 90 90 stategy to end the HIV Pandemic by 2030: Can the supply chain handle it?” Journal of the International AIDS Society. 2016; 19(1):20917. United Nations Programme on HIV/AIDS (UNAIDS). “Global gains made toward 90-90-90 targets.” Geneva, Switzerland; July 18, 2016. Wallensky, R.; Borre, E.; Bekker, L.; et al. “The Anticipated Clinical and Economic Effects of 90-90-90 in South Africa.” Annals of Internal Medicine. September 6, 2016;165(5):325-333. How Many People Have Died of HIV/AIDS? Are We on Track to Reverse Global HIV? Does HIV Treatment as Prevention Work?